It appears the holiday season was a very, very good one for e-reader sales. According to Amazon, the Kindle was the "most-gifted product" in the company's history. And for the first time ever, the online retailer's customers bought more Kindle e-books than physical books on Christmas day. While that's great news for Amazon, the e-reader market is likely to change dramatically next year. A new slate of competitors--most notably Apple's rumored tablet device--are expected to ship within months, and some may bring innovations that make the Kindle seem downright dowdy by comparison. Add a color screen: The Kindle's paper-like E-ink display may reduce eyestrain and prolong battery life, but it appears lifeless and drab next to a high-resolution color screen. And while E-ink is great for books, it doesn't do justice to magazines and newspapers, both of which are available (via subscription) to Kindle users. Periodicals cry out for color, and the Kindle may have to ditch E-ink to appease its news publishing partners. A lot of readers may prefer a color screen too. Kindle DX becomes a full-fledged tablet: So the Apple tablet's going to have a 10-inch display? Well, the Kindle DX does too--OK, 9.7 inches, but that's close enough. Of course, the DX isn't designed to be a full-fledged media player or web browser, but who's to say it couldn't be? Amazon could add a color touchscreen and better browsing and media-playback tools to turn the DX into a full-on tablet computer. No more DRM: Many, but not all, Kindle titles have copy protection, which prevents users from transferring their e-books to another device. (Amazon lets publishers decide whether to use DRM.) While copy protection seems like a logical step to thwart e-book piracy, consumers may balk at buying digital books that are tied to a limited number of e-readers. A less-restrictive DRM policy may boost Kindle usage in the long run. 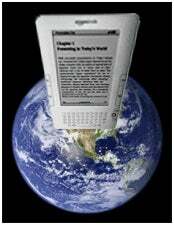 Don't change a thing: Hey, the Kindle's a hit, isn't it? Aside from a few minor tweaks--maybe Amazon could bring back the SD card slot, for instance--there's no reason to mess with success. Then again, if the Apple tablet starts luring away Kindle users, the do-nothing approach could prove disastrous.